Need a solid list of WordPress speed optimization plugins? Boy do I have the list for YOU. Cache plugins, image optimization, lazy load, AMP, Gravatar cache, load time monitoring, and plugins that fix Google Font + Analytics errors in GTmetrix and Pingdom. I use many of these speed plugins on my own site and have 100% GTmetrix scores. I also do WordPress speed optimization for a living, so I’m pretty much a nerd about it. I recommend running your WordPress site through GTmetrix (check the Page Speed and YSlow tabs) or another speed testing tool to use as a benchmark. Once you’ve installed each plugin, retest your GTmetrix scores to see how it affects your page load time and scores. Most plugins have at least a 4.5 star rating, and rest assured, I have done my research and testing. pps. Hosting is still the #1 factor in the WordPress optimization guide and SiteGround was rated #1 in 10 different Facebook polls. If you need a solid host with fast servers and great support, they’re who I use – you can see my GTmetrix report. They’ll also migrate you for free. WP Rocket was rated the #1 cache plugin in multiple Facebook polls and is what I use. It’s a $39 premium plugin but well worth it, since your hosting and cache plugin and generally the top 2 speed factors. It’s also the easiest cache plugin to configure and is updated frequently with new features. You should only be using 1 cache plugin, but it’s best to try at least 2-3 (the ones I listed) to see which one gives you the best results/scores in Pingdom/GTmetrix. My WP Rocket tutorial shows you how to configure the settings with Cloudflare + StackPath. I keep it updated with the latest versions and reference WP Rocket’s documentation. This can fix a TON of items in GTmetrix and is probably the 2nd biggest speed factor outside of hosting. It’s the highest rated FREE cache plugin and is super easy to configure. My WP Fastest Cache tutorial shows you how to configure the tabs and integrate it with Cloudflare + StackPath but here is the first tab (below). Unlike WP Rocket, this plugin doesn’t have an option for lazy loading images/videos, database cleanup, and other options. So you will need to use WP-Optimize and the Lazy Load For Videos plugins if you want those features too (recommended). Removes trash, spam, post revisions, transients, and other junk files stored in your database which after accumulating, can slow down both your WordPress site and admin panel. I would run this every couple weeks (both WP-Optimize and WP Rocket have an option to schedule database cleanups). If you’re using WP Rocket you do NOT need this plugin since WP Rocket has an option for this in the database settings. If using another cache plugin, use WP-Optimize. Losslessly compress images which fixes optimize images items in GTmetrix. I have a full guide to image optimization (there are actually 20 ways) but the main ones are lossless compression, serve scaled images (resizing them to the correct dimensions) and specify image dimensions(setting a width/height in the images’s HTML or CSS). Imagify gives you 25MB/month free, then you need to buy a plan or wait until next month for it to reset. Imagify, ShortPixel, Smush, Kraken, and EWWW all basically do the same thing. You only need to be using one of them. Specify Image Dimensions is an item in GTmetrix and other speed tools which means you need to add a width/height to the image’s HTML or CSS. This plugin automatically adds a width/height to images that don’t currently have one set. To my knowledge, it doesn’t specify dimensions for images located in page builders, widgets, or any areas outside the visual editor. Lazy loads videos by inserting responsive “Lite YouTube Embeds” which only calls the “fat” YouTube player when the play button is clicked. Videos take the longest time to load by FAR. Just to give you an idea, my W3 Total Cache tutorial only has 2 videos, but when I lazy load them that post’s load time went from 5s to 1.5s. It has the same function as light video embeds. This is a must-have speed plugin which disables unnecessary features in WordPress core that may consume CPU. It also helps remove query strings (although the best solution for that is to use lightweight plugins), loads fonts asynchronously, hosts your Google Analytics tracking code locally, limits the number of post revisions, disables autosaves, and other speed features. It can also paginate comments after 20 comments or disable them after 28 days. CAOS For WebFonts fixes Google Font errors in GTmetrix, Pingdom, and PageSpeed Insights. It will download your Google Fonts (using the Google Fonts Helper API) and generate a stylesheet for it. Afterwards, you will need to remove any requests to external font sources. Tip: if using external fonts, be minimal with the number of fonts (and font weights) you choose. If for some reason this plugin doesn’t fix errors, I have a guide for hosting Google Fonts locally. CAOS fixes the leverage browser caching item in GTMetrix by hosting Google Analytics locally. Just install the plugin, enter your Tracking-ID, and CAOS will add the Tracking Code to the header (or footer). CAOS is also compatible with Monster Insights and has other options. WP Rocket, Swift Performance, and WP Disable can also do this (you only need to use one). Accelerated mobile pages is a Google project that makes mobile pages load faster. It also adds an “AMP” stamp next to your mobile snippets. This plugin will change the layout/design of your mobile pages, so be sure to fully customize the settings. If for some reason you don’t like it, delete it and it will revert back to your old design. You can also use the Glue For Yoast & AMP plugin to customize text color, link color, hover color, and other elements of your mobile pages. Selectively disable plugins on certain pages/posts. The most common example is contact forms (which should load on pages with contact forms). Social share plugins can also usually be disabled on pages. You’ll want to configure the settings, global plugins, and edit specific pages/posts to selectively disable plugins. You can read their documentation if you need help. Step 1: Sign up for a CDN (I use StackPath who has 31 data centers) and create a CDN site. If you have a lot of comments on posts, Gravatars can absolutely destroy your load times and GTmetrix reports. You can use this plugin to cache Gravatar images. Another option is to disable Gravatars completely (though this will prevent photos from showing up) and make your comments section look boring. But it’s a tradeoff between Gravatars or your load times. Find your slowest load plugins, queries, scripts, and other elements that take longest to load. P3 Profiler used to be great at finding slow plugins, but hasn’t been updated for years. Query monitor is as an alternative. Another alternative is to run your site through GTmetrix and use the Waterfall tab. You can also check this list of high CPU plugins. The GTmetrix WordPress plugin monitors you load times and Page Speed + YSlow scores, then sends you a report directly in your WordPress dashboard, or through scheduled email reports. Display PHP Version simply shows you which PHP version you’re running. PHP Compatibility Checker scans your plugins to make sure they’re compatible with new PHP versions. Some WordPress plugins aren’t updated frequently or coded well – running this beforehand can prevent errors (like your website from breaking) due to incompatible plugins. Shows overall performance of hosting and whether your technology (PHP, MySQL, WordPress versions) is running slow, in which case it should be updated. It also shows your slowest pages. Cool Trick: one of the only things PageSpeed Insights is good for is checking for server response times. Google says it should be under 200ms. If not, your server (hosting) is slow. Instead of fixing all your links manually, use the Better Search And Replace plugin to update them in bulk. It can also be helpful for fixing broken links, or even bulk updating links/images which appear on multiple pages/posts. Better Search Replace can be an enormous time saver. SiteGround – they were rated the #1 host in a 10 Facebook polls, many of which were taken by the official WP Hosting Facebook Group with 10,000+ members. I won’t tell you to switch hosts if you don’t need to, but it’s the #1 speed factor and worth considering if you have a slow server response time. SiteGround will migrate you for free and their average load time is 1.3s (I use their semi-dedicated GoGeek plan which has 4x more server resources than regular shared hosing and have 100% GTmetrix scores. There’s a reason WordPress recommendsthem and they’re #1 in thread after thread after thread. I would avoid Bluehost, HostGator, iPage, and other hosts owned by EIG. SiteGround is solid and I’ve been with them since 2014. Cloudflare – free CDN and speed/security service which mirrors your site (and offloads resources) on over 150+ data centers. Integrates with most cache plugins with option to use aggressive minification, Railgun, and hotlinking. All my cache plugin tutorials include Cloudflare setup instructions and don’t forget to setup page rules for your WordPress admin. StackPath – paid CDN which adds 30+ additional data centers around the world (more data centers = faster content delivery), reducing the distance between your website/visitors – a recommendation in the WordPress optimization guide. $10/month with a free 30-day trial. Pingdom – most accurate tool for measuring load times according to WP Rocket, though GTmetrix has better recommendations for actually optimizing your site, in my humble opinion. GTmetrix – good for identifying images that need to be optimized using the 3 methods: serving scaled images (resizing them), specifying images dimensions in the HTML/CSS, and optimizing images (lossless compression). GTmetrix recently switched to a fully loaded time metric which shows a longer load time than previously. Their waterfall tab measures individual slow loading elements, and if your time to first byte is long that indicates your hosting is slow. Google PageSpeed Insights – most recommendations can be ignored but it’s good for measuring server response time which Google recommends <200ms or your hosting is slow. Bad Bots .htaccess List – extensive list of spammy bots which when blocked by uploading to .htaccess may significantly reduce CPU usage. You can find out if spammy bots are crawling your site using AWStats (listed in the Analytics tools section). Configuring Wordfence’s crawl limiting rules will also help block fake Google crawlers, spammy bots, excessive crawling, etc. Pronaya (My WordPress Speed Optimizer) – you can hire my WordPress speed optimizer on freelancer.com who I’ve been working with for 5 years and we’ve optimized multiples sites to load 500% faster. His name is Pronaya, he’s $40/hour and has a perfect 5/5 star review with 19 reviews (just sign up for a Freelancer account and search for user BDKAMOL). If you think I’m good at speed optimization, Pronaya is way better. I’ve also been working with Usama (his username is I333) who is quite cheaper but is also amazing with 4.9/5 stars and 375+ reviews. My WordPress Speed Optimization Tutorial – has 300+ comments with people saying things like “My page speed score on gtmetrix went from 69 to 93” and “this might be one of the most helpful posts I’ve ever read.” Tons of people have used it to improve Pingdom/GTmetrix scores. 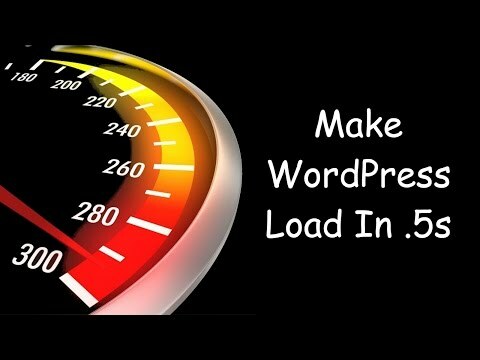 I hope you find these WordPress speed optimization plugins useful! If you have questions leave me a comment. Or if you simply need to fix your slow WordPress site, see my tutorial above. It has over 300 comments and has helped many people reduce their load time to <1s.